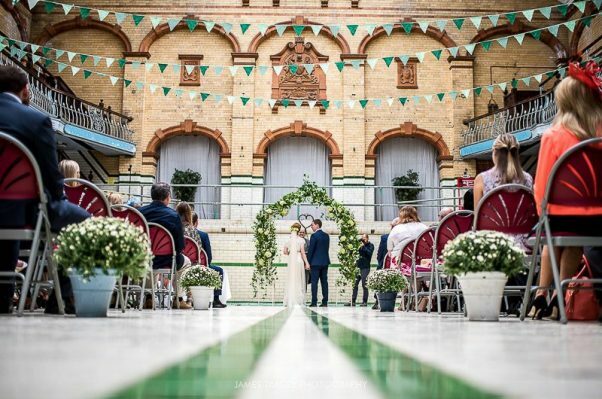 If you want to get hitched in Manchester, you’ve got your choice of beautiful old buildings full of history. Before you choose your vintage wedding band Manchester, or decide which canapés your guests will love, the venue has to come first. Shopping around? We’ve created a shortlist to make life a bit easier. 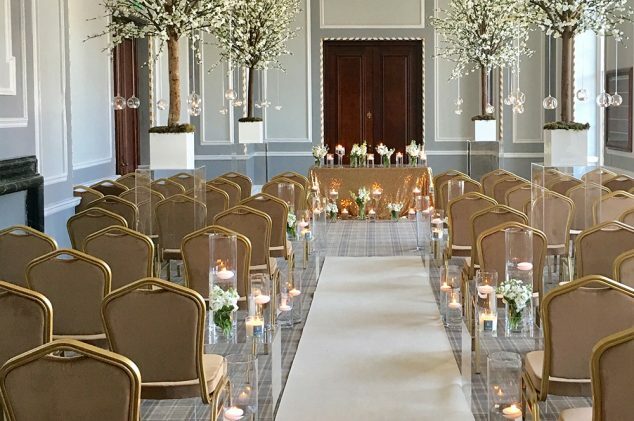 These are the city’s best authentically period and vintage wedding venues. With its authentic Victorian pool, distinctive green tiles, and quirky changing rooms, Victoria Baths is one of the most unique period wedding venues you’ll come across in the country, never mind in Manchester. The pool’s not used much anymore, but you can still get married or host your reception in the deep end. If you’re a Peaky Blinders fan you’ll recognise it from several episodes – they’ve filmed here a few times. It even provided the setting for a horse fair that ended in a gun fight. Love dark wood, cloisters, and imposing corridors? 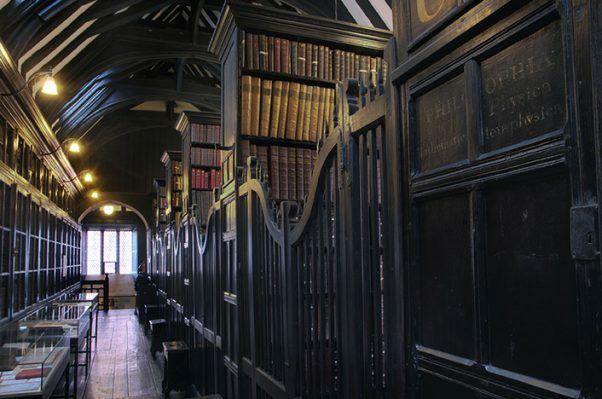 Look no further than Chetham’s, “the oldest free public reference library in the United Kingdom”. All those cosy corners and book shelves make for surprisingly good acoustics for your wedding band Manchester. They have various period rooms to hire for different numbers. The medieval Baronial Hall is the oldest, dating back to 1421. Other parts of the interior date back to the 17th Century. Your guests will think they’re going to a rural stately home when they see the photos, but they’re actually still in the heart of Manchester city centre with access to all the best hotels. Established in 1865, this classic pub is certainly not of the ‘old man playing darts’ variety. 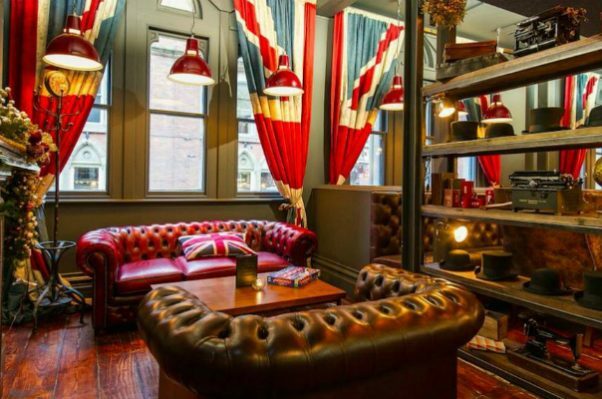 Located in Manchester’s historic Albert Square, you’ll get “proper British food” in a cosy but dramatic venue. It’s full of industrial history, with an open kitchen, exposed brickwork and studded leather furniture. A former Freemason’s Hall, this 1920s building has been recently renovated. All the Grade II listed features have, of course, been preserved though. Its authentic 20s architecture is an ideal setting for music and dancing from your vintage wedding band Manchester. There are 11 function rooms to choose from. The most opulent is The Museum, with its marble fireplace, gold curtains, and massive chandelier. Their food is promisingly known for “informal elegance”. Get married surrounded by Lowrys and Valettes, then host your drinks reception with the Pre-Raphaelites. Your reception will follow in the gallery’s glass atrium. 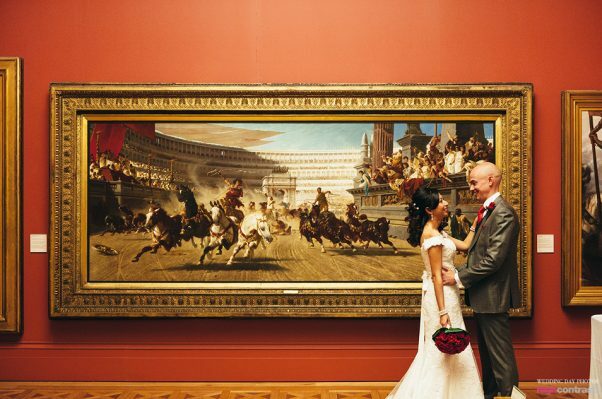 This is a must for any art-loving couple, or anyone who likes to be surrounded by history. How about a little music to go with your stunning venue? Silk Street Swing offer something “a little bit different”. We play jazz and swing music in prestigious settings up and down the UK, and can play you up the aisle, through your reception, or get your guests dancing to some jazz hits from the last century. Make sure your wedding swings! Find out more.